Catherine Malandrino is a womenswear brand that draws from the styles of Paris and Provence. The clothing embodies femininity and strength. With Big Apple Buddy’s personal shopping service, you can now buy the latest pieces from the USA Catherine Malandrino online store anytime, anywhere. Looking for a new jumpsuit? Catherine Malandrino has a whole selection of summery jumpsuits to choose from. 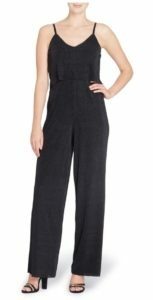 The Owens Jumpsuit is perfect for transitioning from a day in the office to a night out on the town. The flowy legs and fluid wraparound paneling ensure that you’ll stay cool in the Summer heat. 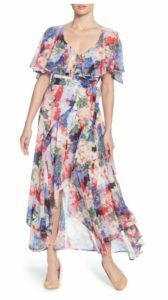 If you’re looking for a statement piece, look no further than the Jos Floral Capelet Wrap Dress. Flowy and feminine, this dress will easily become your wardrobe favorite. Check out Catherine Malandrino’s whole selection of gorgeous Summer dresses. Catherine Malandrino's separates are must-have Summer staples. The selection of pants and skirts is filled with comfortable yet chic and versatile pieces. 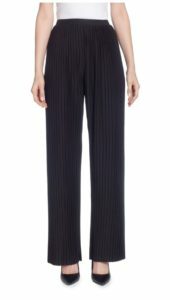 The Nielson Pleat Pants are a fun take on classics business attire. Catherine Malandrino is based in New York City. The USA Catherine Malandrino online store unfortunately does not offer international shipping. Not to worry though! Big Apple Buddy, your personal shopper, can help you buy products from the USA Catherine Malandrino online store and ship them to your doorstep, no matter where you are in the world. We offer international shipping to over 110 countries including Australia, Austria, Azerbaijan, Bahrain, Belgium, British Virgin Islands, Brunei, Bulgaria, Canada, Chile, Costa Rica, Croatia, Czech Republic, Denmark, Estonia, Fiji, Finland, France, French Polynesia, Germany, Gibraltar, Greece, Greenland, Hong Kong, Hungary, Iceland, Indonesia, Ireland, Israel, Italy, Japan, Jordan, Kuwait, Latvia, Liechtenstein, Lithuania, Luxembourg, Macau, Malaysia, Maldives, Malta, Marshall Islands, Mauritius, Monaco, the Netherlands, Netherland Antilles, New Zealand, Norway, Oman, Poland, Qatar, Romania, San Marino, Saudi Arabia, Serbia and Montenegro, Seychelles, Singapore, Slovak Republic, Slovenia, Spain, South Africa, St. Lucia, Sweden, Switzerland, Taiwan, Thailand, the UAE, the UK, Vatican City, and Vietnam. If you would like to buy from the USA Catherine Malandrino online store, simply let us know which items you would like to order (by filling out the form below) and we’ll get back to you with a free international shipping quote within 24 hours!